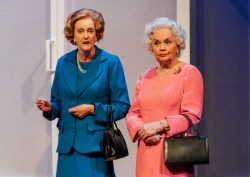 MOIRA Buffini’s 2013 play Hand­­bagged is an imagined look at the private conversations bet­ween the monarch and her Prime Minister – in this case Elizabeth II and Margaret Hilda Thatcher. It could hardly be a more apposite time for a new production, as many will be wondering if the weekly meeting with Her Majesty is the only respite Mrs May has in these days of childish my-gang-your-gang bickering and whispering in Parliament. The show, on at Salisbury until 20th April and touring to York and Oldham, is directed by Jo New­man. The leading roles are each double cast, with Sarah Crowden as T and Susan Penhaligon as Q (the older Mrs Thatcher and HMQ) with Caroline Harker as Liz and Eve Matheson as Mags (their younger selves). 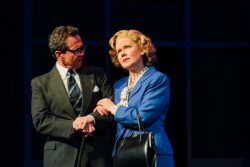 Jahvel Hall and Andy Secombe play all the MPs, state leaders, husbands and even Nancy Reagan, with huge panache, sometimes stepping out of character to be the actors hired to support the powerful women to tell their stories. 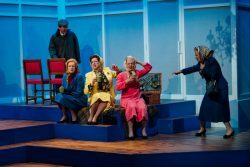 It’s a sparklingly witty script and clearly delighted the packed Playhouse audience, the majority of whom remembered the events depicted with a misty nostalgia. 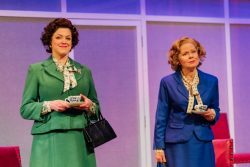 The voice of Mrs Thatcher, those carefully practised manufactured vowels and determined set of the head, were brilliantly captured by Sarah Crowden, and Susan Penhaligon brought out the warm mischievousnesss of Her Majesty. Her walk-about in the audience is always a showstopper. Neither is ever without the ubiquitous handbag, and the show has the audience longing for more – in many ways. If you are fed up with BREXIT (and that goes for a huge number of us, whatever we wanted the outcome to be) this is a time to laugh, even if it does make us reflect on how the country got to where it is today.